The ABC Analysis Reports application allows you to print a report that shows the inventory in descending order by year‑to‑date usage dollar cost, year-to-date sales dollars, usage dollar cost year‑to‑date, or year-to-date dollar margin (dollar sales ‑ dollar cost). 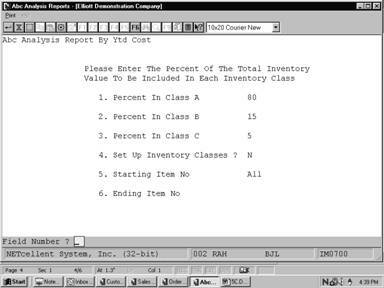 The report also categorizes the items according to percentage figures you enter for inventory classes A, B and C. As an option, you may have the inventory classes in your Inventory Item File set according to the results of this report. At the end of the report, a summary is printed according to the sug­gested inventory classes calculated based on your entered percentages. Enter the percentage of the total inventory value that is to be included in each inventory class. These three fields must total 100. The default value is A=80. 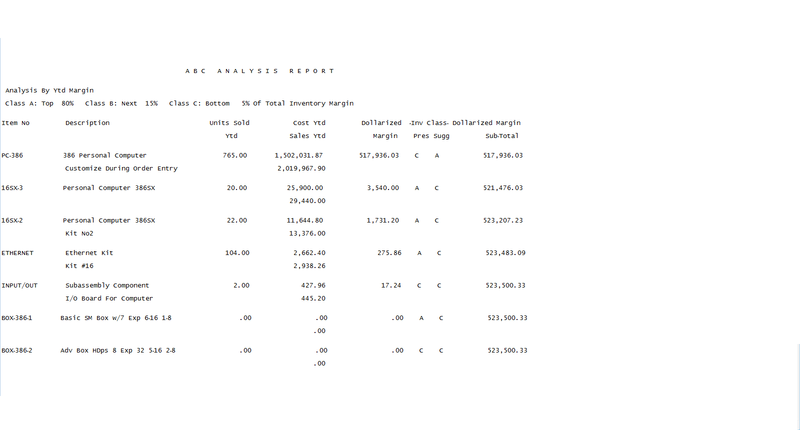 Enter the percentage of the total inventory value that is to be included in each inventory class. These three fields must total 100. The default value is B=15. 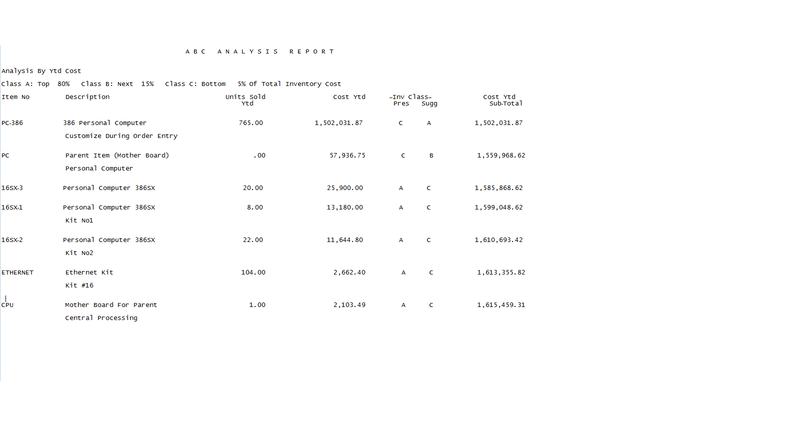 Enter the percentage of the total inventory value that is to be included in each inventory class. These three fields must total 100. The default value is C=5. If Y is entered, the Inventory Class field in the Inventory Item File will be set to the class determined by the above-entered percentages. Enter the starting item number for the range of items to be printed. Enter the ending item number for the above range.